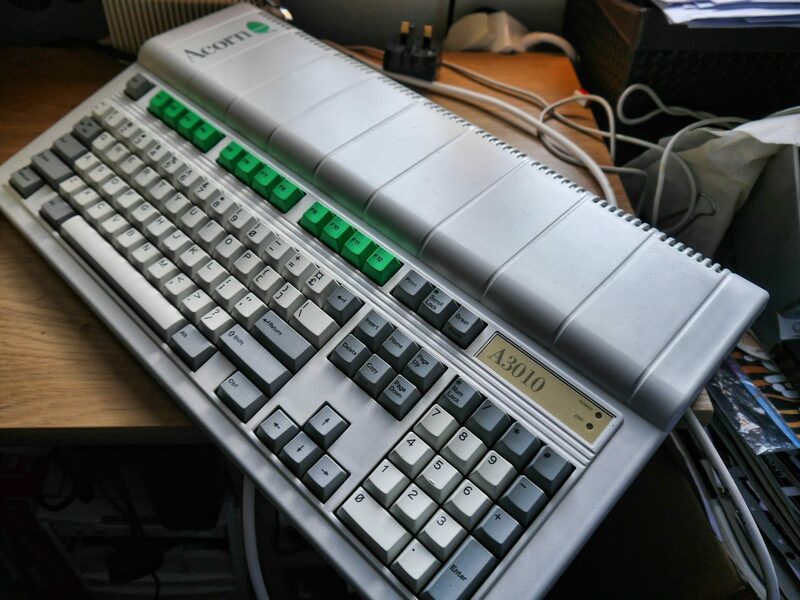 From the BBC Micro to the Acorn Archimedes. 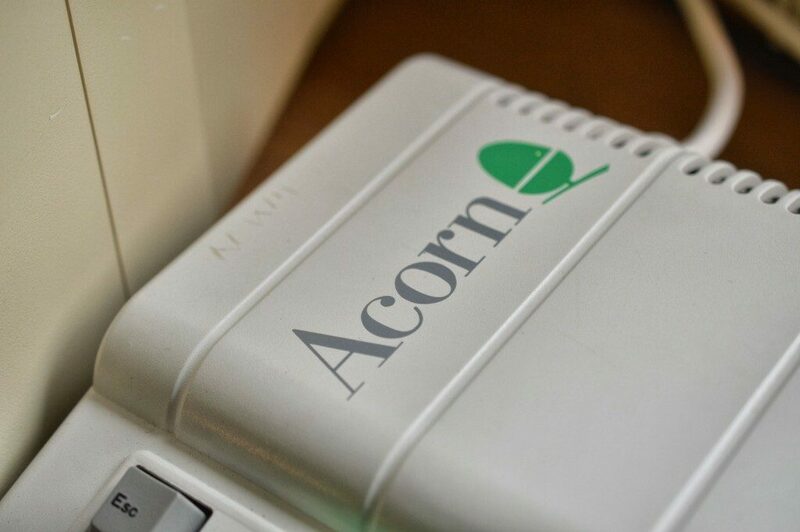 This is a full system review of the Acorn A3010, from the Archimedes range. 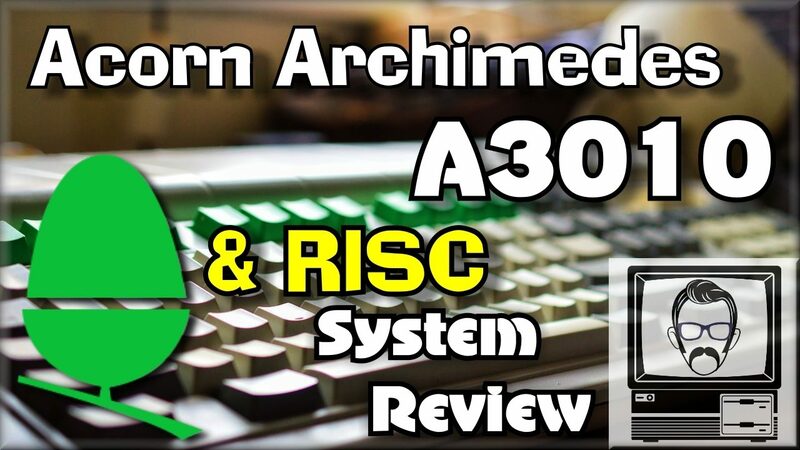 Including a history of the Archimedes computers, an explanation of RISC, a look at RISC OS, some discussion on the ARM chip and of course, some classic Gameplay action on the machine Acorn penned specifically for the home computing & gaming market. Enjoy! 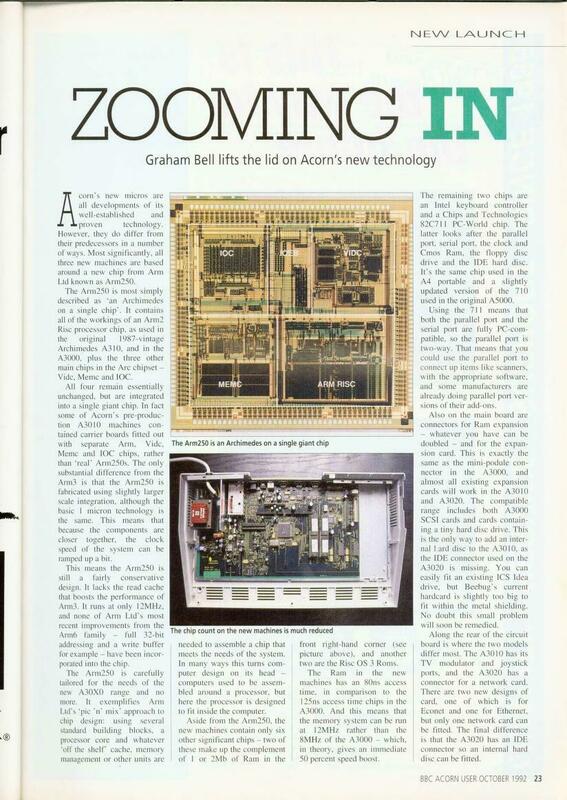 And grow they did, Acorn established themselves in 1978 with Chris Curry, who parted working for Clive Sinclair and Hermann Hauser, who helped provide backing for the company. From this point they recruited Steve Furber and Rodger Wilson – who is now known as Sophie Wilson for those of you left confused- , and they created the Acorn Atom and subsequently, the BBC Micro… a machine created in collaboration with the BBC to promote literacy in schools, and feature heavily in the BBC’s own computing television programme, Micro Live. However, it’s from this point on that that Oak tree began to show signs of rot. Acorn’s electron failed to meet the sales that Acorn had hoped for, which led to Olivetti effectively buying the company out in late 1985, but not before Acorn had started development on a now infamous micro-processor… the ARM chip. 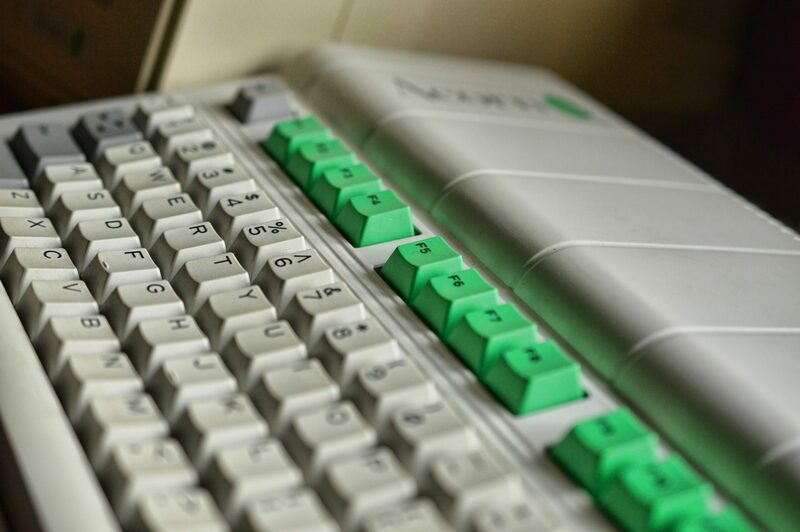 This processor, designed mostly by the original Acorn team, kept the brand going for the next decade, and was the core of Acorn’s new Archimedes machines, with the powerful and well kitted A300 machine launching in mid 1987. This original machinie came bundled with the ROM based Arthur operating system and featured 8 bit stereo sound and 256 colour output. It fared well in Ireland, Australia and the UK, where it was still flying under the BBC Literacy in schools logo. 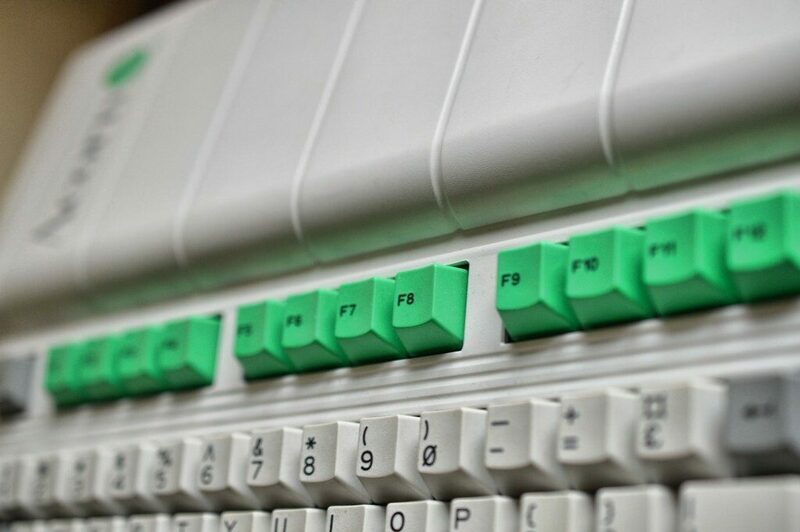 These machines were followed by the 3000 series in 1989, which adopted the familiar all-in-one form factor in line with the Atari ST and Amiga models available at the time. As with the BBC Micro, Acorn produced a monitor stand to allow the machine to be housed easier in school environments. The A3000 retailed at £649 and featured an 8MHz ARM2 processor, 1MB of RAM, and came with the new RISC 2 Operating system. It also provided a number of new video resolutions as high as 800×600, with up to 16 colours. This was the last machine to come branded under the BBC Micro name. A number of other Archimedes machines followed, but these were mainly desktop units designed for business or high end education. 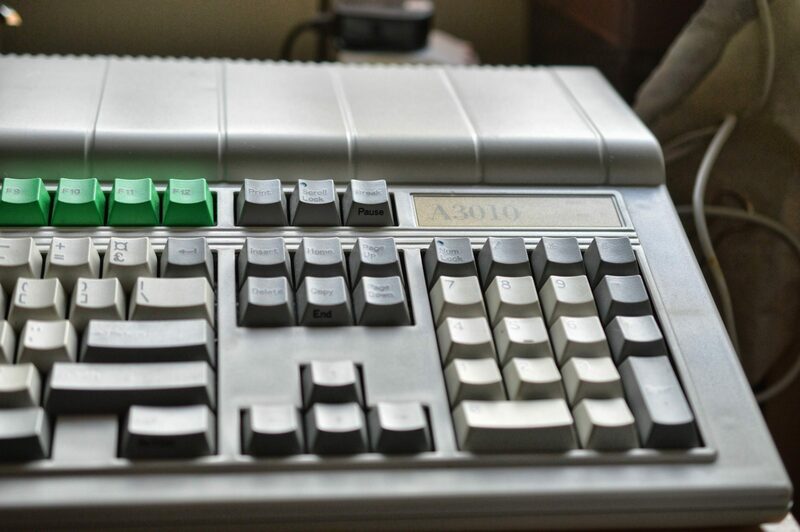 The true successor is the machine I have in my current possession… The elegantly lined Acorn A3010…. Now, I’d like to point out that Archimedes was an ancient Greek Mathematician regarded as possibly THE leading scientist from classical antiquity. He mastered a number of geometrical theorems and invented many wonders such as the Archimedes screw. If you hadn’t realised, this is who the Acorn machines are named after. 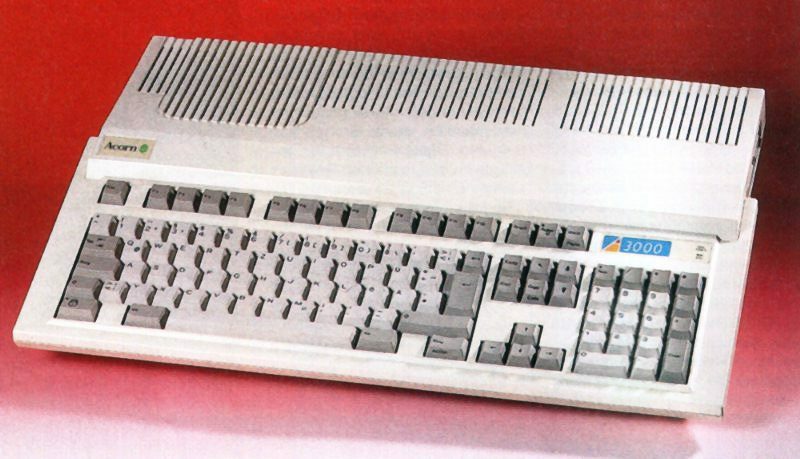 Launching in September 1992 for £499, the A3010 was intended as more of a home computing model to compete with Amiga’s and Atari’s offerings, although it was pretty late and expensive guest to the party. It came with a TV modulator to allow standard RF output, 9 pin joystick ports, and also boasted a new ARM250 CPU with a faster 12Mhz clock speed and integrated sound, video & memory controller components. Given that this machine also featured the new and rapid ROM based RISC OS, it was a pretty formidable machine in terms of performance, and like for like, could easily stand up to the Amiga machines. The machine came in a number of packages, including the Family Solution, Action Pack, Learning Curve and this special edition monstrosity. Of course, launching so late, the main problem was weaving into an already established market, whilst concurrently being squeezed out of the educational markets by IBM compatible PCs, which were becoming much more affordable and mainstream. The high price of the A3010, combined with these problems would again lead Acorn’s computer development onto a downward path… BUT, before we get onto that downward spiral of depression, let’s focus on the good points. Undoubtedly, we’ve all heard of RISC, but what does it mean? Well, in simple terms, it stands for Reduced Instruction Set Computing, which translates to meaning that there are fewer functions built into the CPU, therefore making it more efficient & lower powered. It’s essentially a more elegant, bare to the bones CPU, compared to say an Intel processor, which houses many functions in hardware, which could effectively be run in software. So even though these functions are left to software, the hardware efficiency, more than makes up for it. 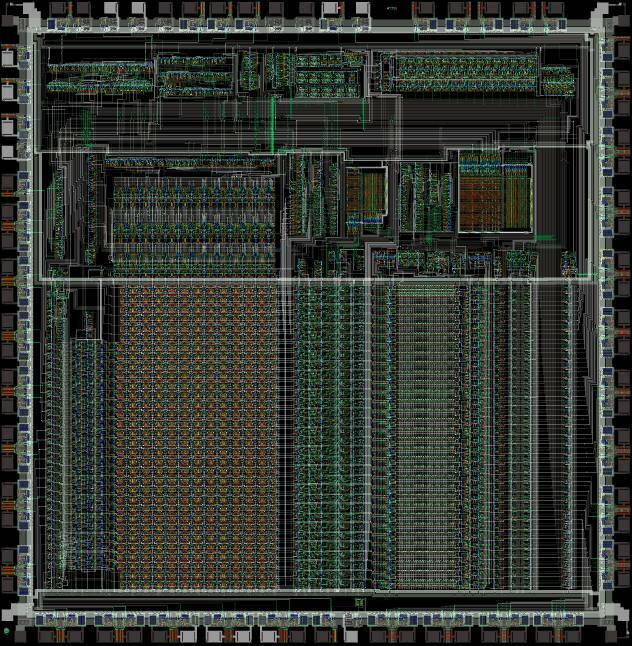 Now although RISC processing wasn’t exclusive to Acorn, the ARM chips were. 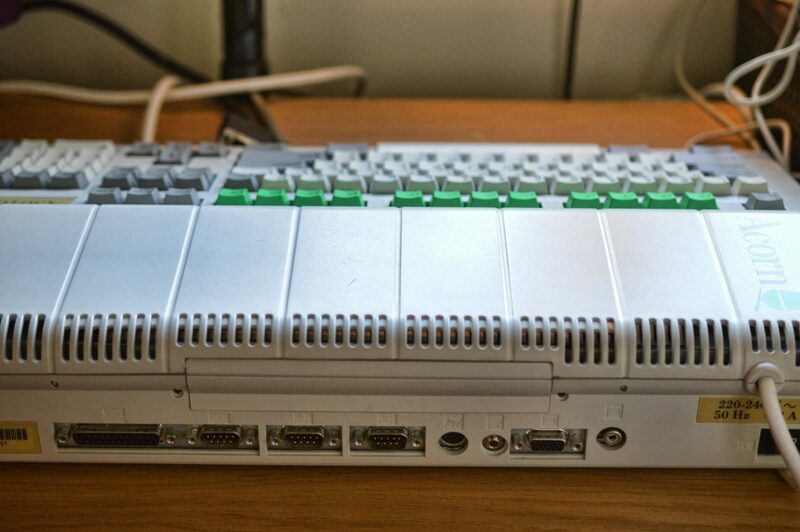 ARM standing for Acorn RISC Machine, and was originally intended for an office automation system. 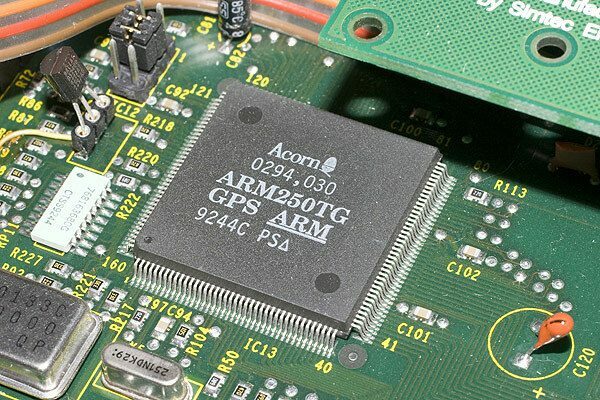 But, thanks to the flexibility of a small instruction set, and the incredibly efficient design by the acorn team, these processors and associated chip set would form the basis of the Archimedes system. The flexibility and efficiency are the reason why we have newer versions of them present in the majority of our small devices today. Your mobile phone almost certainly has one. Compared to the CISC (Complex instruction set computing) Motorola 68000 processors present in the Amiga and Atari ST machines, the Archimedes A3010 ARM processor was several times faster in terms of instruction cycles. This is elegantly demonstrated in the fractal based Mandelbrot sets and 3D Lander game by David Braben (of Elite fame). The only exceptions were when particular complex instructions were executed. These required multiple steps for the ARM processors, but were completed in a single step on the 68000. 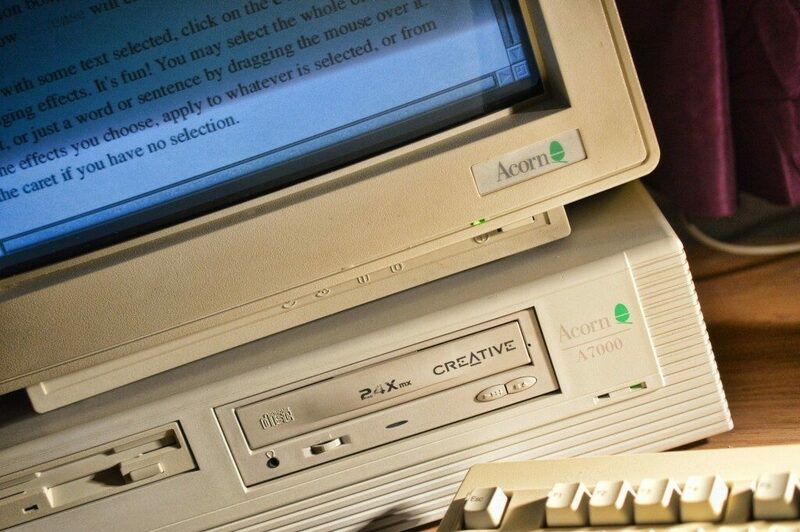 Another factor of the Acorn range was the Operating system being built into ROM, and a mighty fine operating system it was too. Now you might shout, but hey! Most Atari ST‘s had their operating system and GEM Desktop built into ROM….. yeah, they did, but RISC OS was incredibly powerful and user friendly. Sharing much in common with much later operating systems such as Windows 95, it really was ahead of it’s time. 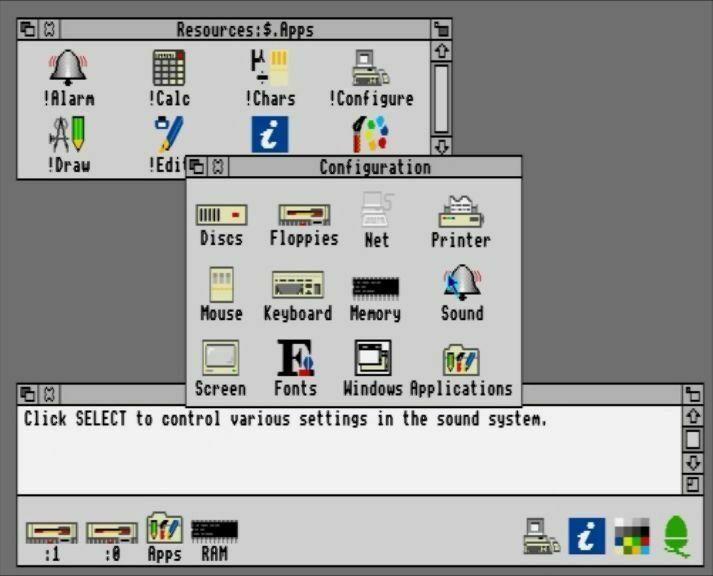 RISC OS 3.11 comes installed on my A3010, and offers a volume driven, windows based experience, similar to what you’d find on most modern systems. It employs co-operative multitasking, which effectively simulates true multitasking by giving up operating time depending on which application has the focus, and is incredibly user friendly. I had no trouble just diving right into it. 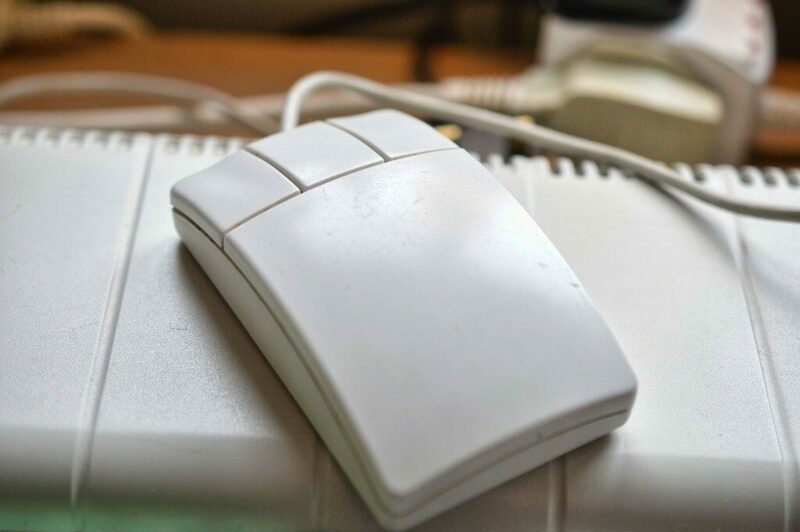 It’s also one of the first interfaces to adopted the three button mouse, with the middle button used for menu tasks, left for selecting and right for opposites (such as erasing on a paint programme). The OS comes bundled with a number of programmes to ease your computing pleasure and retains BBC BASIC, which just gives me that warm educational 80s classic computer feel. This hark back to the past is one aspect I love about these machines. 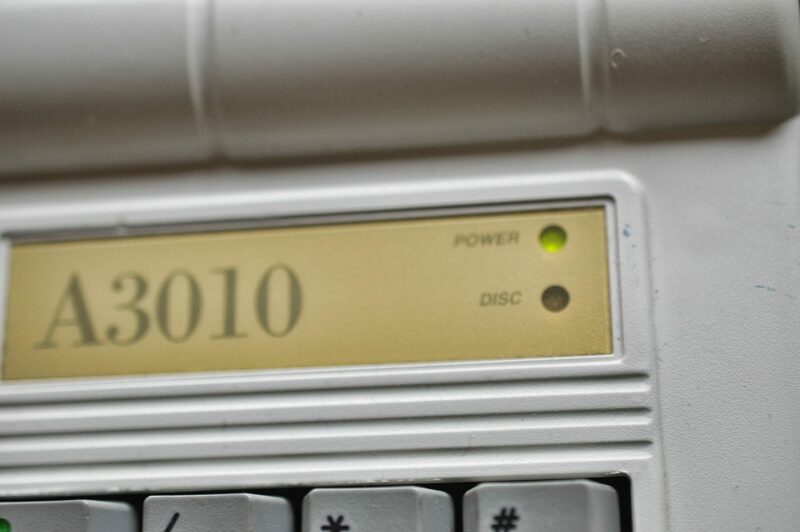 Outside the machine looks very similar to other home computers of the time, although Acorn tried to retain the red function key feel of the earlier BBC Micros. To differentiate across use, they adopted a green colour scheme for the home bound A3010 series, red for the educational models such as the original A3000 and the A3020 which was released at the same time as the A3010 but with more memory and an on board hard disk, and grey for business intended machines such as the A4000, which launched at the same time again, and the A5000 which was oddly launched a year prior. 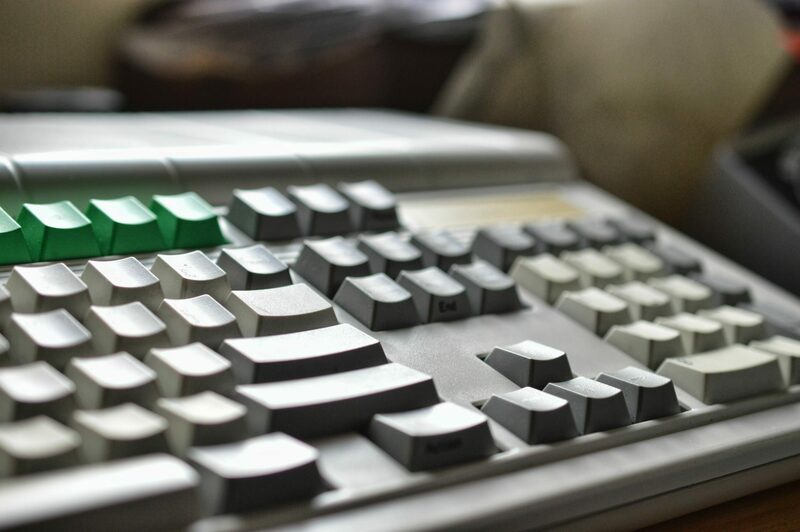 The keyboard offers a nice tactile response, and feels much higher quality than both the Amiga and Atari, which always felt a bit wobbly & clackety to my sensitive little digits. Swinging her round to the back we find a plethora of ports for…. Also, this is where you find the power switch, with the PSU built into the case, much like The Atari ST.
On the left hand side of the machine is a handy reset switch. And although I’ve mentioned hardware briefly already, if we really want to get down and dirty, which we of course do, inside the machine we find…. The ARM250 can produce 8 channel 8 bit stereo sound which is multiplexed in software into hardware channel. It can also display several resolutions up to 800×600 and a maximum colour output of 256 (from 4096) at 640×512. The chip could actually handle resolutions up to 1152×896 with 2 colours if required, but these weren’t built into the operating system as standard. 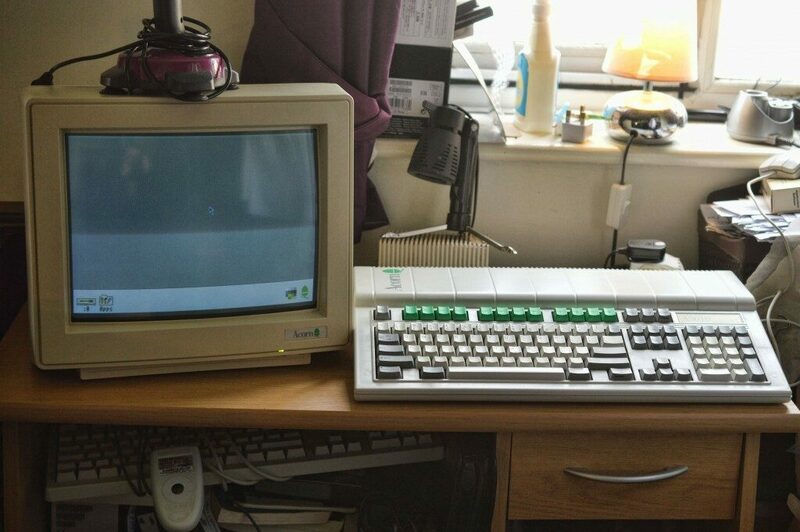 Hooked up to this Acorn AKF60 montior, the display looks crisp and clean at 640×480. 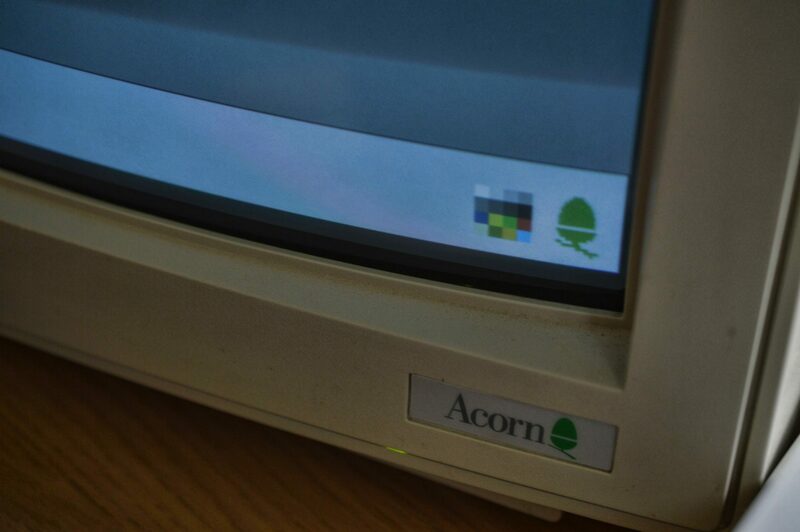 Because of the slightly strange scan rates utilised by Acorn machines, not all VGA screens will accept the input, and most of the time you’ll need a pretty forgiving Multi-sync monitor if you haven’t got a proper Acorn model. This was improved over the A3000 which featured an analogue RGB out but lacked a VGA VIDC enhancer. So I guess there’s little left to say about this fine machine. Like so many, it could have been so much more than it was, but like so many, it was slightly mis-placed, a little too expensive and just too optimistic for it’s own good. 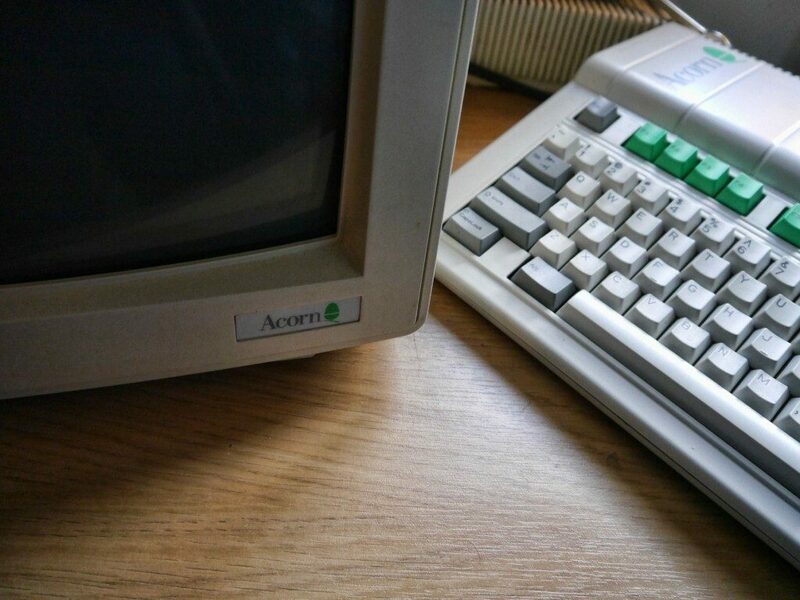 The A3010 was followed by the A7000 in 1995, which I also have in my collection, and is the last of the Archimedes series, although this machine was much more like the RISC PCs Acorn launched as a successor to the Archimedes range in 1994. So in that context, I feel it warrants it’s own review. In the mean time, feel free to check out my inspection of it from the other week. So, the Archimedes range on the whole did reasonably well. It kept the flag flying in the education market and it’s RISC performance helped it gain traction in the business world. It’s just a shame that the A3010 was a little too late for the home market. I think we can all agree however, that the true legacy for this machine, and Acorn in general is not only that they gave countless British children the opportunity to learn computing and programming, but also the amazing ARM processor. As an original subsidiary of Acorn, it continues to this day as one of the most dominant micro processor designers in the world. And as legacies go, that’s quite a good one to lay claim to.